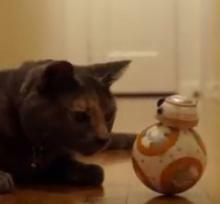 Cat, Meet Droid -- The Animal Video Of The Day!!! BB-8 is the breakout character from the upcoming new Star Wars film, The Force Awakens. But, how will he fare against a ferocious feline? A little mores to ther left. No, a smidge backs to ther right. 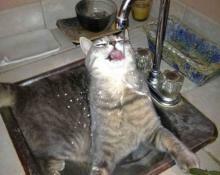 Ahhhhhhhh! That's ther spots! 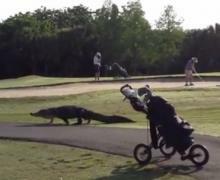 Meanwhile, In Florida -- The Animal Video Of The Day!!! Or in this case, skeletons a-plenty. 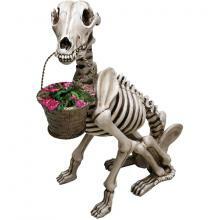 Skel-A-Dog Skeleton Dog Statue has been on guard at your door for so long that he is down to skin and bones. Well, bones anyway. I justs love it when Mom reads to us, evens when I don't understands all ther human wordses. How To Make A Raccoon Happy! 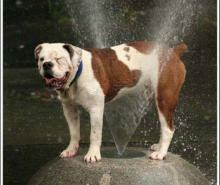 The Animal Video Of The Day!!! 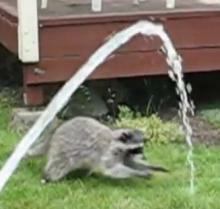 It turns out that all you need is a hose to make a raccoon very, very happy. 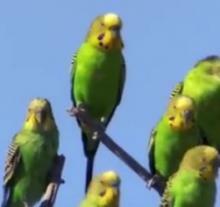 A Swarm Of Budgies! The Animal Video Of The Day!!! "I'm singings in ther rain, justs singings in ther rain! Whats a glorious feelings, I'm happy agains!"